If you haven’t, check out the Introductory Article to to gain understanding of how these rankings were built. That article can be found by clicking here. There’s nothing that hasn’t been said about Stan ‘The Man’ Musial. He is the qinitessential Cardinal, the best player in franchise history, and one of the most respected athletes in American professional sports history. During his career, the Cardinals were succesful: they won three World Series titles and another National League pennant. When he retired in 1963, he held 17 Major League records, 29 National League records, and nine All-Star Game records. Yet, everywhere but St. Louis, for some reason, Musial isn’t mentioned along with DiMaggio, Mays, Mantle, and Robinson. A three-time MVP record twenty-four-time All-Star, Musial’s Baseball-Reference page is littered with bold-faced type indicating that he led the league in that particular category in that particular year. He led the National League in games played four times, runs five times, hits six times, doubles eight times, triples five times, RBI’s twice, batting average seven times, on-base percentage six times, slugging percentage six times, OPS seven times, OPS+ six times, and total bases six times. Joe Posnanski told a story on his bog that captures the skill of Musial the ballplayer and the character of Musial the person. There was this game, early in ’54, the year that Edward Murrow went after Joe McCarthy and Roger Bannister ran a mile in four minutes, and Musial’s Cardinals trailed the Chicago Cubs 3-0 in the seventh inning. Cubs lefty pitcher Paul Minner was baffling the Cardinals — he had allowed just two singles, had faced one over the minimum. Then he found himself facing Musial with Wally Moon was on first base and two outs. Musial crushed a ball to deep right field, a double. Moon ran all the around the bases to score. Musial cruised into second. The whole complexion of the game had changed. And it was only then that everyone seemed to notice the first base umpire, Lee Ballanfant, was holding up his arms. He had called Musial’s double a foul ball. Nobody quite knew how to react. The ball, at least in the Cardinals’ view, had clearly been fair. It was not even an especially close call. And while the crowd cheered wildly (the game was in Chicago) the guys on the Cardinals bench went crazy. They rushed on the field, shortstop Solly Hemus first, manager Eddie Stanky right behind him, and both were thrown out by home plate umpire Augie Donatelli. Old Augie Donatelli. He would play a big role in Musial’s life. Donatelli would be one of the umpires there less than a month later when Musial hit five homers in a doubleheader. Much later, he was behind the plate for Musial’s 3,000th hit. Anyway, he was here now, taking away a Musial hit, throwing out Hemus and Stanky, threatening pinch hitter Peanuts Lowrey with ejection, clearing the saloon like an old cowboy, even though, he certainly knew, the ball had been fair. Musial, who in the confusion had not been told exactly what was going on, walked over to Donatelli. Then, according to the stories, he calmly asked, “What happened Augie? It didn’t count, huh?” Augie nodded sadly and said the umpire had called the ball foul. Stan Musial stepped back promptly doubled to precisely the same spot in right field. This time, Ballanfant called the ball fair. The Cardinals scored six runs in the inning and won the game. The stories that filled Costas’ eulogy that day are testament to the fact that Stan was, in Costas’ words, a thoroughly decent human being. The entire eulogy is below, which I highly suggest watching. 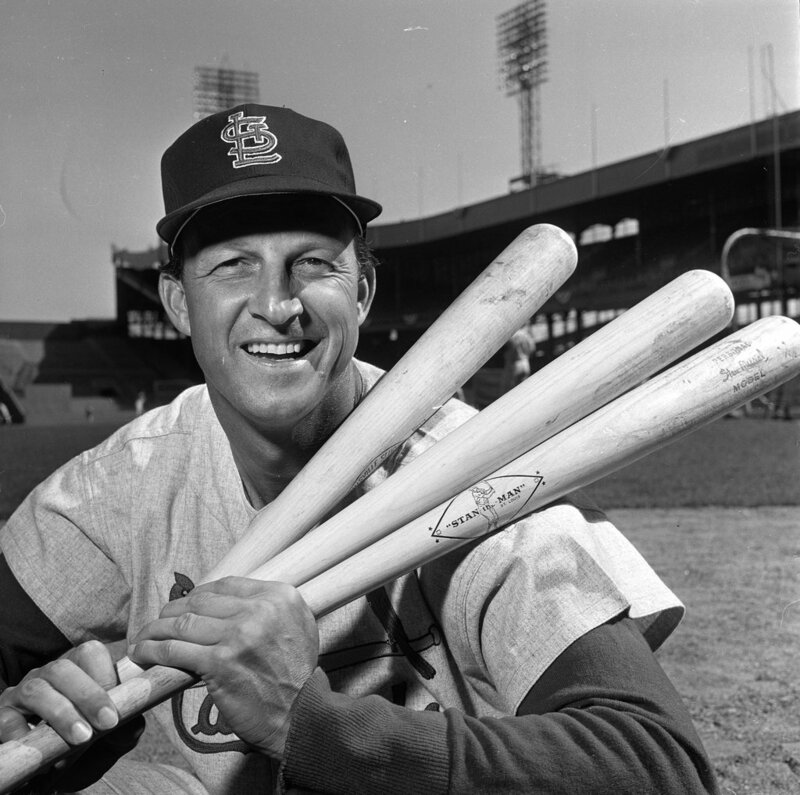 Musial finished his career the same way he started it: a two-for-three day. He finished with an impeccable record of consistency that included 1,815 hits at home and 1,815 hits on the road, the grand total of 3,630 standing as the National League record until Pete Rose broke it in 1981. Baseball’s perfect warrior, baseball’s perfect knight.